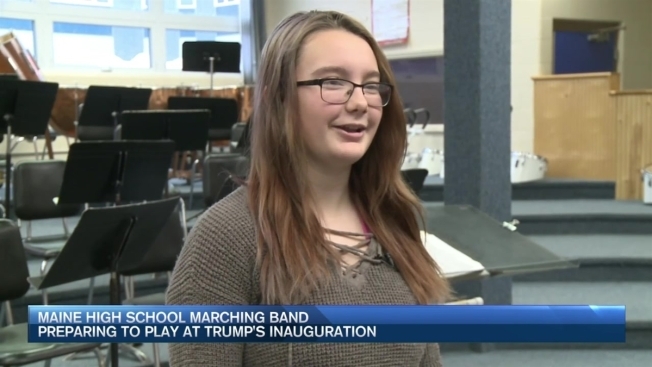 A small marching band from the northernmost town in Maine has received a big honor: they have been invited to play at the Presidential Inauguration. “The Pride of Madawaska” marching band, 28 members strong, will be playing at the “Make America Great! Welcome Concert” at the Lincoln Memorial on Thursday, Jan. 19, the day before Donald Trump is inaugurated. “I’m probably going to be really nervous, but it will be worth it in the end, because we’ll be able to show our talent in front of so many people at a very special event,” said Madawaska marching band member Taylor Dionne. The invitation was a complete surprise to the students. Marching Band Director Ben Meiklejohn quietly applied to be a part of the performance in November. The band just found out about the trip a few weeks ago. “It’s a testament to the hard work these students have, and the passion they have for music, to be able to put together a program on short notice,” said Meiklejohn. Madawaska’s band is the only ensemble from Maine – and the only from New England – to be invited to perform. “It gives us a great sense of pride for being a small town band, representing small town America,” said Meiklejohn. The Madawaska community has rallied around the band to help fundraise the $20,000 needed for the trip.